Do you ever feel that time is moving way too quickly? I remember when I was little and my father used to tell me that the older you get the faster time goes. Of course back then, I thought he was making it up! If I could only say to him today - "You were so right!" In this week's Keri Report I personally apologize for rushing you ahead. We just finished Halloween and I am already sharing stories of the holiday season and 2019! Trust me, I really wish time could just stand still! Growing up we always had a protein, a carb, and a veggie (yes, a veggie is technically a carb too) on our plate for dinner and to this day I still aim for it. Anyway, now that I am cooking for my granddaughter I find I am already trying to instill that behavior in her. Mind you, with a toddler, I might not always get the result I am hoping for. The other night Miss F wanted pasta (of course, who doesn't? ), I wanted steak and hubby didn't care! I have a secret to share! I don't love to spend time in the kitchen, but I do love to eat healthy. Quite the conundrum, no? SO, given this I really try and create dishes that require little prep, not a lot of pots (hate cleanup), and can be ready to eat in less than 30 minutes. For my above creation I started by sauteing garlic in algae oil and grape tomatoes sliced in half. Well folks, it is officially the fall season and everywhere I look there’s a pumpkin something - pumpkin pie, pumpkin latte, pumpkin soup, etc. And guess what? I don’t like pumpkin, at all! Yes, I know how good for me it is; it’s packed with vitamin A and low in calories. But my taste buds are my taste buds. Personally, this time of the year, this gal is all about the apples. Does anyone ever feel the need to defend their food choices? Well, we shouldn't have to!! Recently I had this discussion with someone who said that "scooping" a bagel is disordered eating! I should of just said, "I disagree" and left it at that. But instead, I felt the need to defend my choice. 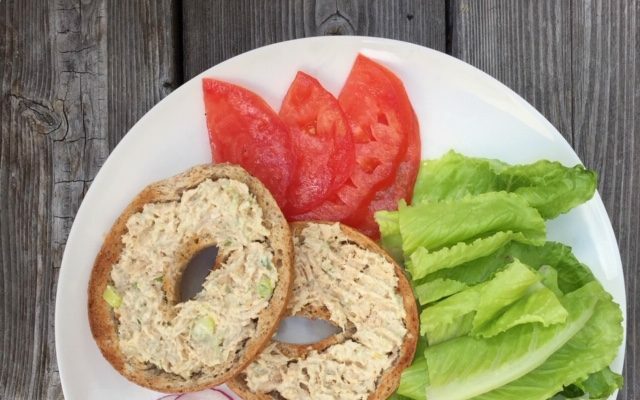 Hey - for me, scooping a bagel means more room for my protein choice (in this case tuna), less mess eating (I also like to eat it open-faced) and again MORE room for veggie toppings. For those of us who live in the east coast once Labor Day hits we feel like the summer is over. I KNOW, it doesn't officially end until Sept 21st; but for us that doesn't matter. Here' a picture of my feet and legs (bruised and all) digging into the sand. In the last "Keri Report" I had written that I hadn't made it ONCE to the beach. So guess what? I went and changed that. And now that the summer is over, I could only wish I had gone more! This past weekend my brother-n-law, Paul, and his wife Mindy, were visiting and I made a barbecue for them along with some of my husband's cousins. Before entertaining I always ask the following of my guests: "Any food allergies, intolerance, or strong dislikes that I should know about?" (Yes, I do consider myself a good host!) Anyway, the answer was NO from everyone. It was when I decided on the menu, skirt steak and salmon, that Paul and Mindy informed me that they don't like salmon, BUT would be fine with just the steak. I don't know about the rest of you, but sometimes I really have NO idea what to cook for dinner! It's like, "just ate that" or "totally not in the mood". Who can relate? Anyway, the other day in my quandary, I realized I hadn't eaten scallops in like forever, so that solved the problem. Googled how to grill scallops (olive oil, salt & pepper, 3 minutes/side), looked in the fridge for a grain to cook (hello black rice) and picked up a tex-mex salad at the store simply because it called my name. Now, if I could only decide what to eat tonight? Hmmm, maybe I'll just go out! As long as I can remember, I have started my dinner meal with a salad. (Thanks Mom & Dad!) Whether I am dining in or dining out - it doesn't seem to matter. It's also one of the first healthy eating tips I provide to my patients and the media. The reason for this is two-fold: 1. The fiber from the salad helps to fill you up, so you may be less likely to overeat your main meal; and 2. ALL the nutrients that a salad provides is priceless.